Every year, Master Mechanic Head Office showcases the unique strengths and key focuses that each franchise offers their communities. For the past 14 years, the team at Master Mechanic Matheson have been honoured to win the Master Mechanic Platinum Performance Award. We are so thankful for our staff, who continue to deliver on our promise for top performance each year, and to our customers for making our days fun and enjoyable. At Master Mechanic Matheson, we promise our customers many things – and we always deliver! In our daily interactions with our customers, whether that is on the phone, in person, or online, we’re always focusing on delivering top quality customer service. To continue to treat our customers with respect. To offer fair prices and quality parts. To deliver quality through experienced labour and to always continue learning. To source the right answers when a question comes up. With a continued access to a worldwide internet network and electrical and diagnostic tools available, we will find a solution. To have the latest up to date equipment. We’re excited to showcase our newest piece; a snap-on alignment machine to deliver acute wheel alignments to factory specifications, increasing performance, tire wear and control to combat common customer issues like wear from potholes and rough roads. To always give our customers experienced people, specializing in European models, domestic cars, and light trucks. 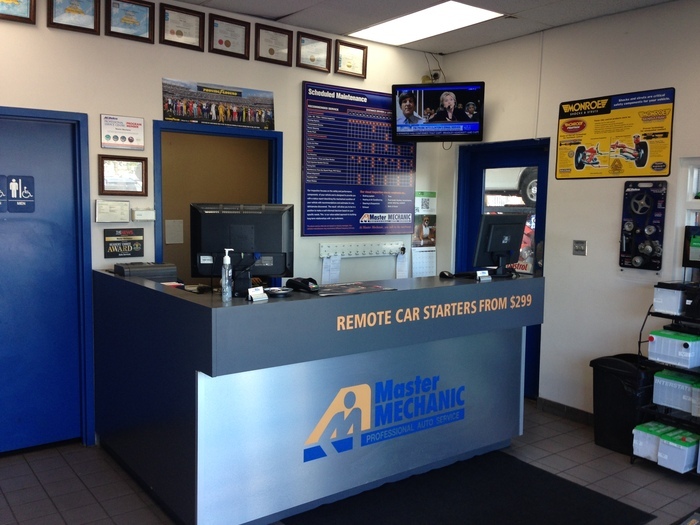 At Master Mechanic Matheson, we PROMISE to deliver beyond customer expectations. Please call either Glenda or Jim at 905-502-6550 to discuss servicing options and your experience with Master Mechanic Matheson. Click here for more information about our location!